Last updated 28 December 2017 . By Leighanne Bent. Two summers ago I found myself face-to-face with one of my favourite brunch spots in the city. The minty cocktails, the carefree atmosphere, the perfectly stacked, fluffy pancakes...I’d probably be back every weekend if my journey there didn’t involve taking 50 different modes of transport. When I heard this place was getting a sister site, namely No. 29 Power Station West, I booked in an evening with one of my wing-men to see if it could live up to my pedestal-worthy hangout. Like many of its younger siblings, No. 29 Battersea Power Station bears an uncanny resemblance to its sister venue, No. 197 Chiswick Fire Station. It's flawless without meaning to be and it has the same incredibly stylish appearance. From the low-slung chairs to the heavy and expensive-looking glassware - it's like walking into a 3D catalogue of all the things you want to pack your adult home with. Stretching for what seems like miles, past all the squishy velvet chairs, shiney marble tables and leather tanned seats, you’ll come across the stairs to the bathroom. That’s where you’ll discover that this place has something No. 197 Chiswick Fire Station doesn’t: a hidden drinking den. 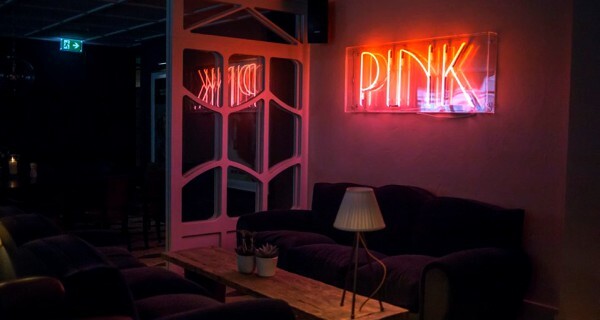 Clamber down the stairs and you’ll not only find the lavatories, but a retro styled snug made up of bright pink neon signs, quirky posters from back in the heyday and another scattering of plush seating. This new Battersea addition also has an alfresco area outfront with wicker-style couches that’s sure to bring flocks of people to the patio come summer. Unashamedly cool, No. 29 Power Station West is like a retro time capsule. There are two things that help me unwind after a tough week in the office: swimming lengths at my local pool and rounds of cocktails in places that I can’t afford. With my Speedo swimsuit drying at home on the radiator and my bank card in my back arse pocket, we swiftly ordered an Espresso Martini (£10.50) and an Old Fashioned (£9.75). The martini was smooth mix, with a fluffy layer of froth and my Old Fashioned strong and characterful. Although No. 29 Power Station West do a similar brunch to its sister site in West London, I visited on a Friday night to dine from their evening menu. From smoked aubergine falafels to the quinoa, feta and cheese rolls, it was fantastic to see a strong variety of meat-free options strewn across the starter section. Unable to avoid ordering at least one veggie dish, we decided on the parmesan cauliflower croquettes (£7.50). Four plump and golden croquettes came out crispy, with a side of truffle mayo and a soft gooey centre. The crispy polenta squid (£7.95) was in the same league, with a light grainy coating and a coriander, spring onion, chilli and aioli dip on the side. Not usually one for ordering a steak, I chose the Bavette Steak (£19) for my main. This cut is an extension of the T-bone, and it came served with house made fries, a handful of watercress and béarnaise sauce. Melt-in-your-mouth and perfectly seasoned - my craving for a comforting dish was satisfied before I put down my knife and fork. My company went for the grilled sea bass and chips (£17.50) with pea hummus, watercress and crème fraîche tartar, but both of us settled to share two sides. We heaped our plates with mountains of garlic greens (£4) and truffle macaroni cheese (£4.50). The greens were buttery with strong hints of garlic and as for the mac ‘n’ cheese? It was a deep, creamy dish with layers of flavour from the addition of truffle. Finishing the evening off with two spoons and one baked apple pot pie (£6.95), the warm vanilla custard drizzled over the warm pastry and chunks of apple was the fairy tale final chapter to our three-course meal. Catering to vegetarians and meat eaters, the menu at No. 29 Power Station West has something for any appetite. 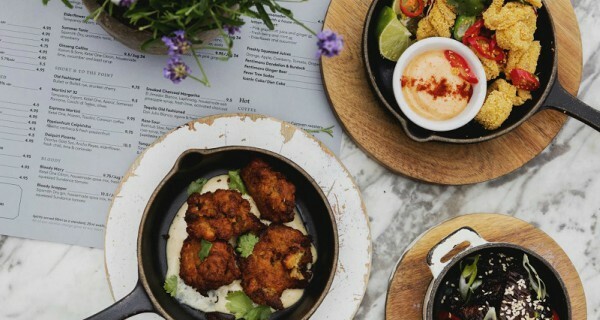 No 29 Power Station West echoes the same 'sit back and relax' atmosphere as its older sibling and although I couldn't rate Chiswick's brunch menu highly enough, the evening menu here proved itself to be pretty darn special too. From the vegetarian starters we wished we ordered more of to the expertly mixed cocktails, it looks like I might be swapping my lengths for swimming in cocktails instead come 2018.